People eat, reach for their phones, text, or in some other way take their eyes off the road nearly 10 percent of the time they are driving, according to a new study conducted by researchers from the National Institutes of Health (NIH) and Virginia Tech. Using video cameras and in-vehicle sensors, the scientists tracked drivers and discovered that risks of distracted driving were greatest among teens. "Any secondary task that takes the novice driver's eyes off the road increases risk," Charlie Klauer, first author of the article, stated in a press release. "A distracted driver is unable to recognize and respond to road hazards, such as the abrupt slowing of a lead vehicle or the sudden entrance of a vehicle, pedestrian, or object." The new study, which tracked the ordinary behavior of drivers in their cars, appears in the New England Journal of Medicine. Car accidents rank among the leading causes of death in the United States. In fact, car crashes rank third, behind cancer and heart disease, in years lost while more than 2.3 million drivers and passengers are treated in hospital emergency rooms as a result of road accidents. Traffic studies reveal that drivers between the ages of 15 and 20 represent only 6.4 percent of all motorists, yet account for 11.4 percent of all fatalities and 14 percent of police-reported crashes that result in injuries. Although most people blame cell phones, even the simplest distractions place young, inexperienced drivers at greater risk of causing an accident. To better understand the nature of ordinary driving behavior, Klauer and her colleagues conducted two studies focusing on distinct groups of participants from Washington, D.C., and southwestern Virginia. The first year-long, 100-car study included drivers between the ages of 18 and 72, with an average of 20 years' experience. A second 18-month study focused on 42 teens who had held a valid driver’s license for less than three weeks when the study began. For both experiments, participants drove vehicles outfitted with data acquisition systems developed at the Virginia Tech Transportation Institute; these systems included a minimum of four continuously running cameras as well as a suite of sensors to gather driving performance data. Later, data coders watched the videos and collected the data, noting any occurence of distracting secondary tasks before or during an instance of a crash or near-crash. For instance, the data coders identified episodes when drivers talked, dialed, or reached for a cell phone, reached for another object in the car, adjusted the car's temperature or radio controls, ate, drank, looked at a crash or something else outside the car, or adjusted a mirror, seatbelt, or window in the car. After coding data and crunching the numbers, what did the researchers discover? First, they found that many participants from both studies were involved in multiple crashes or near-crash events. Oddly, they also discovered that, compared to experienced drivers, novice drivers performed secondary tasks less frequently during the first six months of the study. However, everything changed after that. Between months seven and 15, they matched experienced drivers, and during months 16 through 18, they overtook experienced drivers — they increased their risky behavior by twofold during the last three months of the study. Experienced adults were more than twice as likely to crash or have a near-miss crash when dialing a cell phone, but other secondary tasks did not increase their risk of causing an accident. 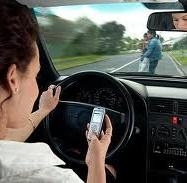 In fact, simply talking on a cell phone did not increase driving risk among either the teen or adult drivers. Because talking on a phone is preceded by reaching for, answering or dialing a phone, though, the results from these studies still provide support for programs that restrict electronic device use, particularly among novice drivers. "Our data support the current trend in implementing restrictions on texting and cell phone use in vehicles," co-author Bruce Simons-Morton, Ed.D., M.P.H., of the NIH, stated in a press release. "But our study shows these distracting practices are especially risky for novice drivers, who haven't developed sound safety judgment behind the wheel. As new forms of technology increasingly are available in cars, it's important that drivers don't feel compelled to answer every incoming call or text." Bottom line? Accidents are not caused by phones, texts, or food, they are caused by drivers who are not paying attention to the road. Anything that removes a driver's eyes from the task at hand needs to be considered a risk.